The 2" long pendant is made of sparkling Swarovski crystals and rhinestones, and hangs from clear crystals. Click picture for our coordinating earrings. that was transformed into a striking 2" X 2" pendant. 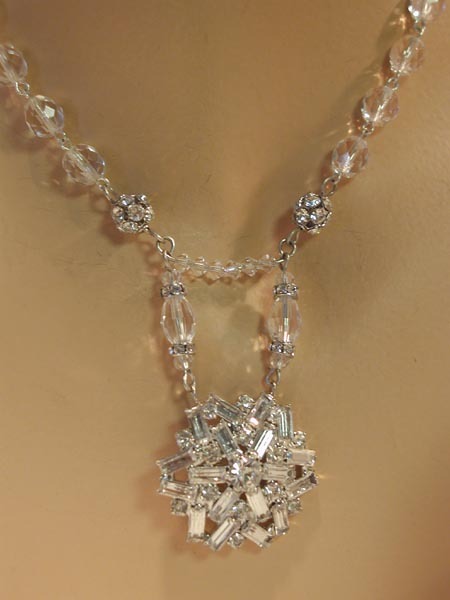 The 16 1/2" necklace is made with a combination of Swarovski crystals, Swarovski rhinestones and Bohemian crystals. If you need the length adjusted, we will be happy to help you. We will be happy to design matching earrings for you. 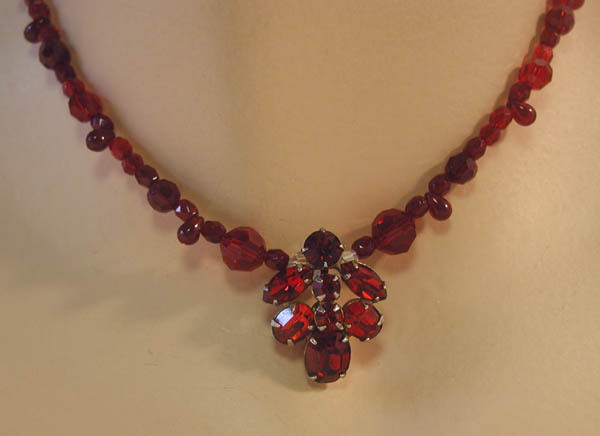 that we have surrounded with siam and garnet Swarovski and Bohemian crystals . 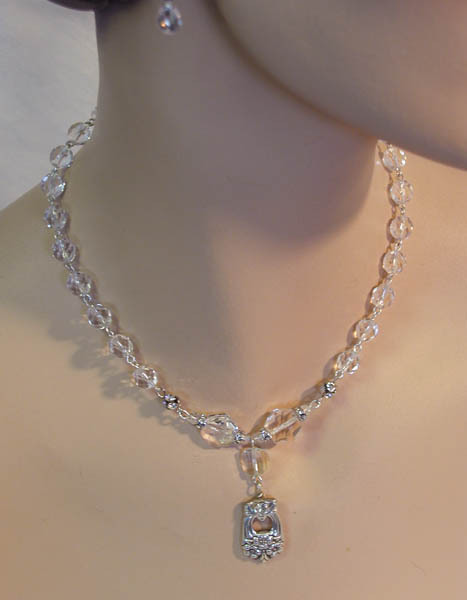 The necklace closes with a gorgeous, never-used vintage silvertone clasp. The necklace is 15 1/2" long. What a wonderful new heirloom! and the pendant including the crystal is 1 5/8". The length can be adjusted if it is not right for you. What a fabulous necklace set! 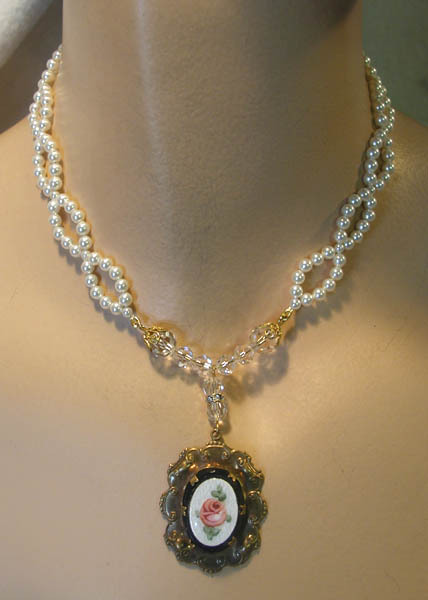 This elegant necklace features a 2 1/8" vintage 1920s pot metal rhinestone and pearl buckle that has been converted into a gorgeous light gold pearl necklace. open the two rhinestone clasps to wear it short. When you wear it short, the piece you remove becomes a bracelet! and 24" when worn long. hang on Sterling with CZ earwires. and worn by clients like the Duchess of Windsor and Barbra Streisand. 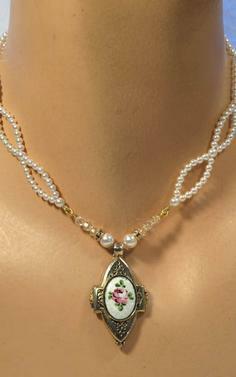 to create this lovely necklace which is wonderful for a bride! 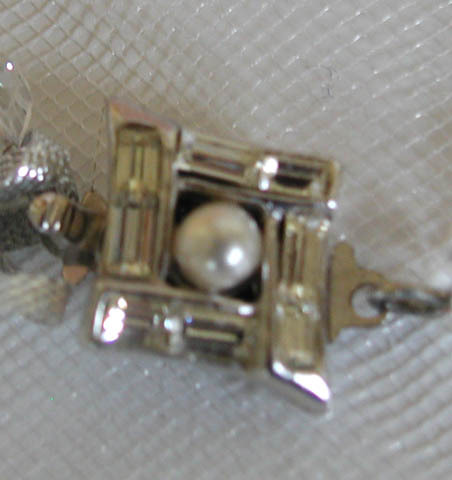 The brooch pendant is 2 1/4" wide and 2" wide tall including the pearl dangles. 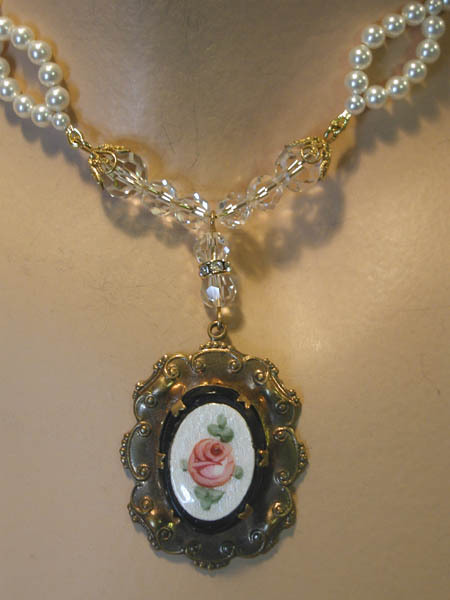 The necklace is 17 1/2" long and closes with a beautiful rhinestone clasp. white Swarovski pearls and rhinestones. The necklace adjusts from 14 1/2"-16" long. 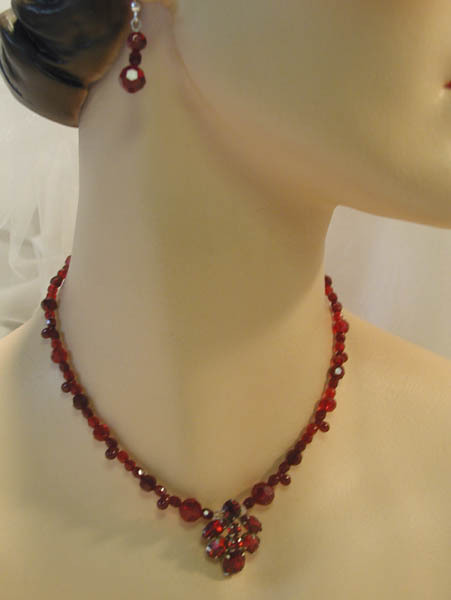 for a holiday or Valentine's Day wedding! 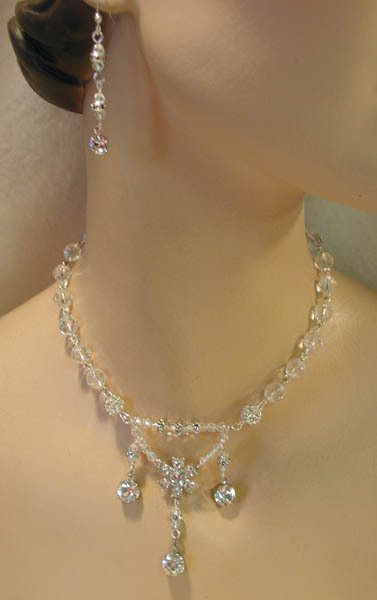 features a vintage rhodium rhinestone flower in the center of a 2 3/8" long triple drop pendant. The clear cystal strands adjust from 14 1/2"-16". 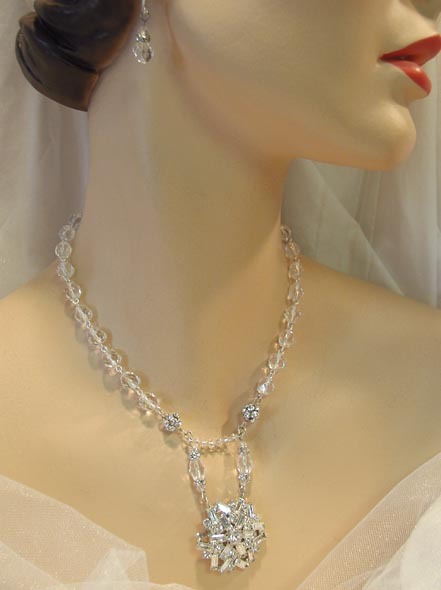 The matching earrings drop 1 1/2"
This absolutely gorgeous regal necklace set features a 2" long pendant that our designer created using both new and vintage components, Swarovski crystals and ivory Swarovski pearls. with a gorgeous rhinestone clasp. 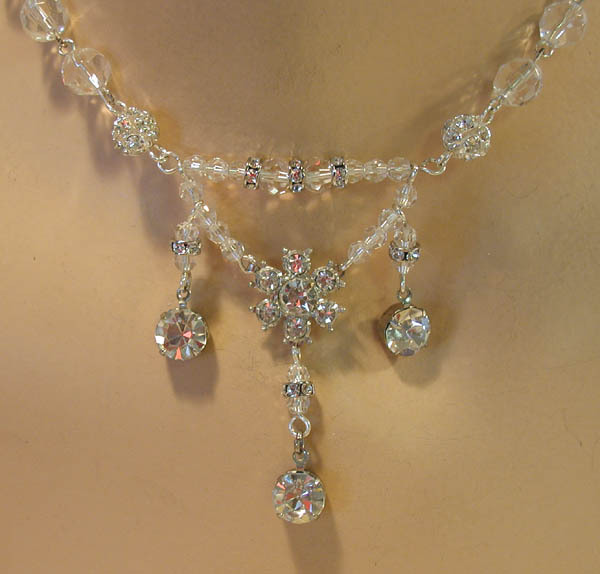 This unique super sparkly bridal choker features a stunning 3" long crystal and rhinestone brooch. or as a pendant on the 17 1/2" long strand. 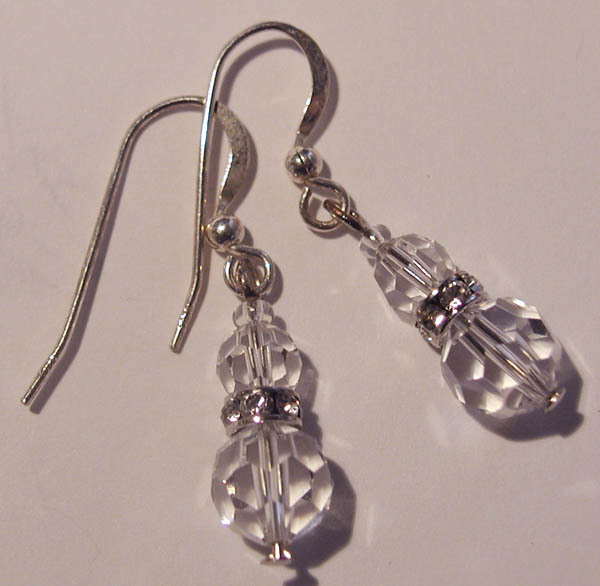 The strand is made of a combination of Swarovski and Bohemian crystals and rhinestones. 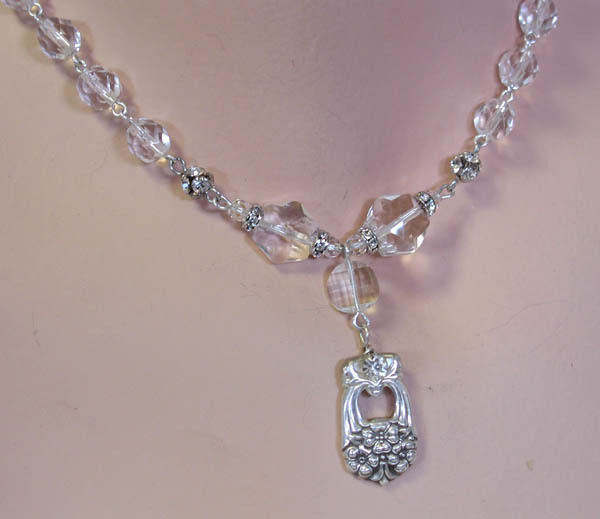 features a stunning 1 5/8" long vintage rhinestone dress clip that has been converted into a pendant and combined with Swarovski and Bohemian crystals and rhinestones. The necklace is 17" long. The matching earrings drop 7/8"
The strand is made of a combination of white Swarovski pearls and crystals. It adjusts from 13 3/4"-14 1/2" long. 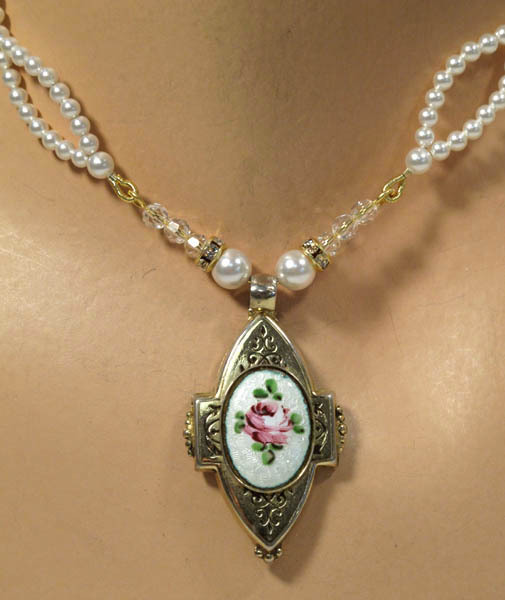 features a unique 1 3/4" X 1 1/2"
1920s-1930s rhinestone pot metal pendant. The necklace is 16 3/4" long. drop 1" Swarovski rhinestone posts. The matching earrings drop 1 5/8"
When you wear it short, the extra piece becomes a bracelet!